For three decades Mike Petrovic has always raced a handy horse from his Queanbeyan base and even though times have changed he still loves the excitement of the track. Petrovic only trains a handful of horses these days and presently his mainstay is Our Revenue who will contest a heat of the Rising Stars for apprentice jockeys at Bathurst on Sunday. Our Revenue falls short in the class category of some of Petrovic’s best horses including his first winner Rum Rustic in 1993 and others like So Turbulent, Kingston Shores and Zum. However, the one thing that has remained is his bond to a racing life outside of his air conditioning business. He also knows time has moved on and he only needs to look at Our Revenue’s apprentice jockey Patrick Scorse to reaffirm how long he has been in racing. “Patrick’s father John rode a fair few winners for me and now Patrick has won a few on Our Revenue which is nice to see” Petrovic said. 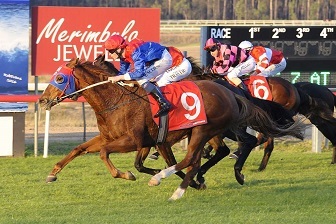 Pat Scorse pilots Our Revenue to victory at Sapphire Coast. Credit: Bradley Photos. Scorse junior has relocated to Sydney from Canberra for a few months and will ride less often at country meetings as he tries to establish himself. He has a strong association with Our Revenue having not missed a place on the four-year-old in his only four rides. Petrovic feels Our Revenue can maintain her consistent record. “I was going to start her somewhere else, but this is a good option,” he said. “She will run the distance (1400m), but the draw on the outside isn’t the best and hopefully Patrick can get her across and settle her midfield. Our Revenue was placed a few times early in her career and posted her maiden victory a year ago, but it has been in recent times she has found started to fulfil her potential. Petrovic said it may be coincidence that Our Revenue’s best form has been under her current race name. “She was known as Revenue but the name was changed because another horse had that one,” he said. The original Revenue won the 1901 Melbourne Cup. Petrovic will take the bulk of his race stable to Bathurst with two-year-old Onsettling Down to contest the Gold Nugget and Pepita chasing her first victory in the Maiden. “I only have four horses in training which is a lot different to the good old days when I would have at least ten and there was a lot of horses in training at Queanbeyan,” he said. View the fields, form and race replays for Sunday's Bathurst meeting here..